While shopping with my daughters for return to school supplies, I was surprisingly reminded of the anxiety and fear that came along with returning to school when I was young. As the memory of these emotions fluttered inside of me, I realized there are still times that I feel a twinge of nervousness when I start something new or when I return to something, after a prolonged absence. That being said, these feeling quickly change to excitement and “I can do this” as I am reminded of all I have overcome in my lifetime. What feelings come up for you when you return to something? How does starting something new get your anxiety, worry or feelings of fear activated? Regardless of age, circumstance and/or situation, feelings of ‘the unknown’ have a way of getting to us, what do you do when you are confronted with them? 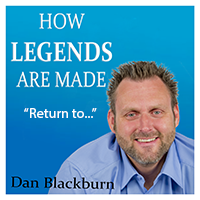 Today’s podcast, learn how legends deal with fear, anxiety and the unknown of returning to something or somewhere we haven’t been in some time. It’s all about your perspective and your willingness to see something new or return to something as a gift…A gift that lasts a lifetime. Enjoy!